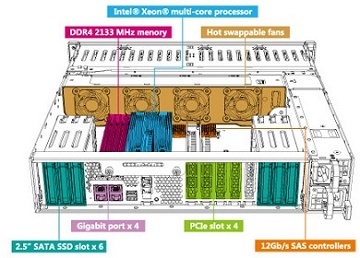 Powered by an advanced 14nm Intel® Xeon® D 64-bit SoC processor, up to 128GB DDR4 ECC RDIMM RAM / 64GB DDR4 non-ECC UDIMM RAM, and the 12Gb/s SAS-enabled GRAND-BDE delivers outstanding performance for data transmission and applications.With a thermal design power of only 20-65W, the GRAND-BDE fulfills demands for both performance and energy saving. A GRAND-BDE 5 PCIE3.0 bővítési lehetőséggel rendelkezik biztosítva a 10/40GbE hálózati kártyák használatát. GRAND-BDE provide 5x built-in PCIe 3.0 expansion slots provide great expandability options for 10GbE/40GbE network adapters, USB 3.1 and 12Gb/s SAS expansion cards, PCIe NVMe SSD - or even a graphics card. A GRAND-BDE lehetővé teszi SAS/SATA 2,5" (30B-D15xx-R10) vagy 3,5" (18B-D15xx-R10) 12GB/s használatát további SAS vezérlő kártya telepítésével. (pl Marwwell). 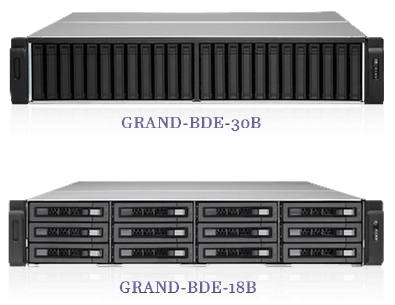 The GRAND-BDE supports SAS 12Gb/s 2.5â€ť drives, allowing for SAS 12Gb/s and SATA 6Gb/s hard drives and SSDs. Businesses can create the most powerful storage by implementing suitable drives based on their needs. Az eszközt műszakilag a QNAP hitelesítette. A QNAP 2004 óta vezető NAS gyártó, a minőséget és megbízhatóságot a kis és nagy vállalati felhasználók több mint 4 milliós tábora garantálja. 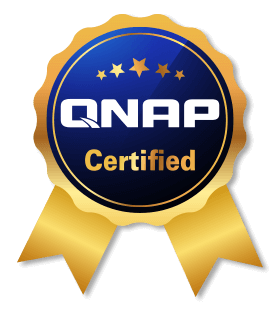 The Grand series are certified by the QNAP. QNAP Systems, Inc. was founded in 2004 as leading network attached storage provider and excelled at both hardware design & software engineering. QNAP provides a comprehensive range of cutting-edge Network-attached Storage (NAS) based on the principles of usability, high security, and flexible scalability leading to win the numerous international prizes. 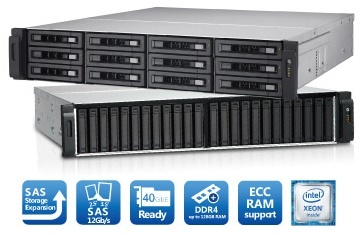 QNAP offers quality NAS products for home and business users with the amount of around 4 million worldwide. Humidity 5 to 95% non-condensing, wet bulb:27°C. Rendelési információ / Ordering Info.